The Most Flexible Genesis Theme, Built For Unlimited Layouts. Prestige is a true powerful multipurpose theme built for flexibility with advanced theme options and so much more! Are very popular today but there are many questions and misconceptions around them, I’ll try to answer many of them here. These questions and answers are meant for mostly residential potlight installations. 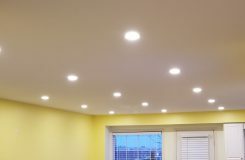 Why are potlights better than regular ceiling lights? They provide more even lighting throughout the space. They are ideal for work spaces, study spaces, offices, living spaces in combination with dimmers. 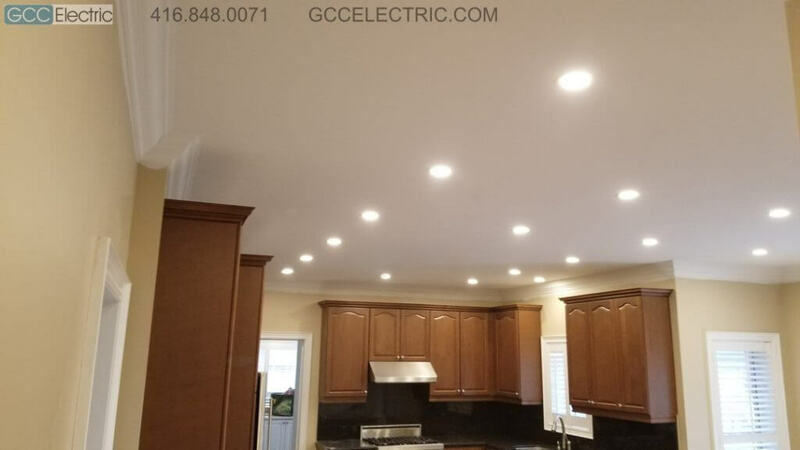 There are some spaces that do not require much light or they require the light to spread in space in directions instead of down, like dining room chandeliers or patio lighting, these spaces are better lit by different type of light or a combination of potlights and other types of lights. 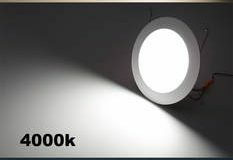 How much power LED potlights consume? 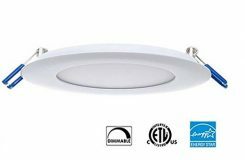 The most commonly installed potlights today are the Ultra thin or flat 4″ LED round potlights, most of them consume 6W or 9W each. There are many other types but these are the most common. 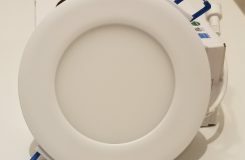 For example 30 potlights, consume 180W in total, if they are 6W or 270W if they are 9W, an old style incandescent light bulb consumes about 50 to 60W of power each. What Color should I get? What does 3000K or 4000K mean? What is a Switch-line and why is it sometimes not included in potlight price? 1) There is a switch and light already. This is the easiest case, we can use it to power the potlights, in most cases the light is taken down, if the location is usable for potlight we install a potlight there, if not we cover it with a white designer cover. In many cases the hole gets filled and drywall repaired. 2) There is a switch but no light. The switch is usually powering one of the receptacles or sometimes only the top or bottom of a receptacle in the room for a floor lamp. 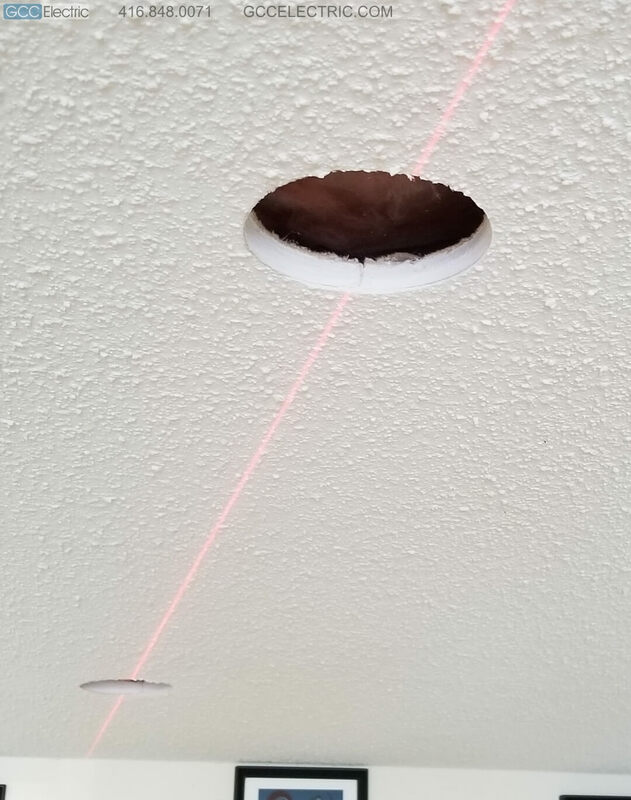 In this case we can rewire the receptacle turning it into a regular receptacle and use the switch for potlight, but a wire still needs to be fished up and through the ceiling corner to the potlights, this is in many cases not easy and sometimes requires an access hole on the drywall. We cover the cut-out of the drywall but it will need some simple sanding and a layer of paint. 3) There is no switch and no light in the room. this is the most difficult case where we need to install a new switch, find a close power source, power it and fish the wire up in the wall, passing the ceiling corner to the potlight. In some cases this requires one or more access holes on the drywall. We cover the cut-outs professionally but it might still require a simple sanding and a layer of paint. The 2) and 3) are sometimes difficult to do and can cost extra. 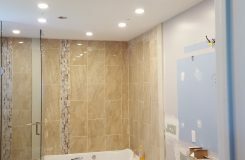 If there is a way to use an existing switch and light, that can always save the extra cost and possibly damage to the drywall when installing switch-lines. What does "No Damage" mean? 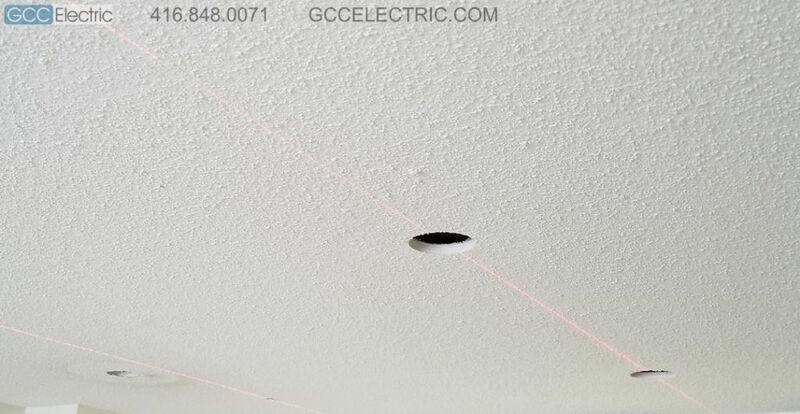 Pot light installation requires drilling circular holes for potlights and connect them with wires, one of the wires needs to be connected to the switch. No damage means fishing wires through ceiling joists without making extra holes that would require ceiling repair. 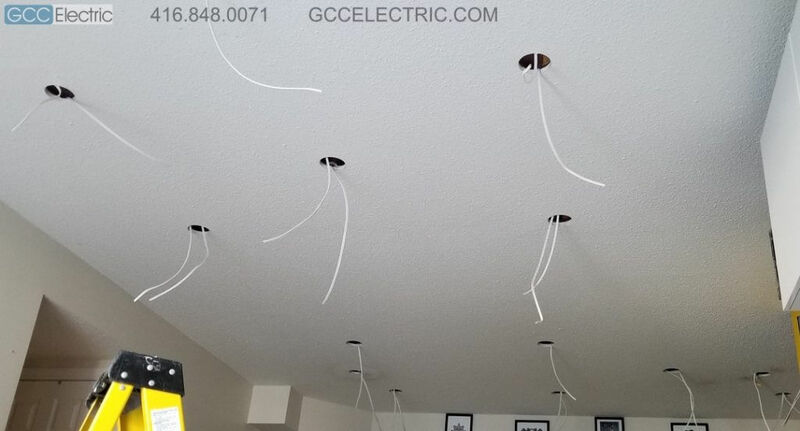 Our Trained professional potlight installers use techniques and special tools to fish wires with no damage to ceilings. How far apart can the potlights be installed? 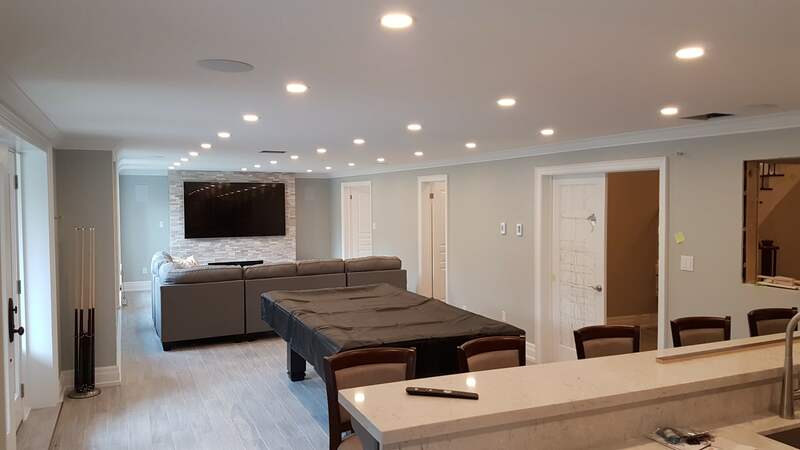 There are certain rules and recommendations about how many and how far apart they should be for good light coverage, but from working with customers we learned that not every customer and room requires ideal lighting or too much lighting. 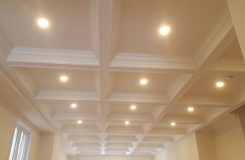 In finished ceilings the distance between potlights in direction crossing the ceiling joists is about 4 feet, usually in direction of the joists there isn’t much of a distance limit. 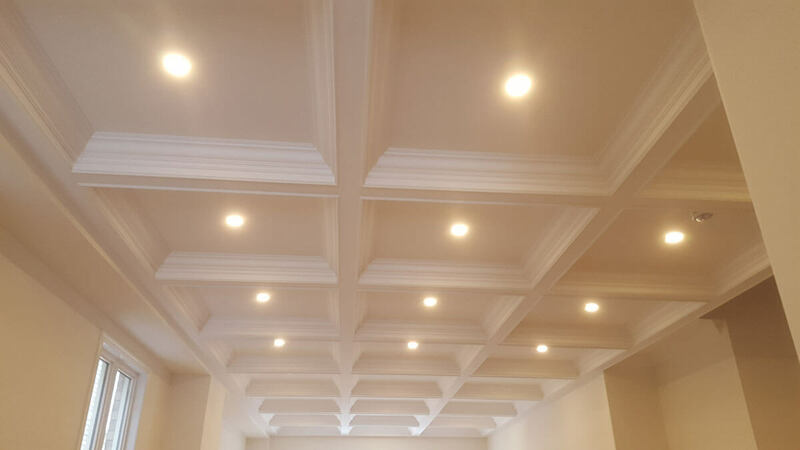 For example in a room 11’x18′ we can place 8 potlights in 2 rows (4×2), they will be 4 feet apart on the long side (crossing the joists) and 5 feet apart on the width of the room (in direction of the joists), which is a very common layout. 4ft or 48″ is the suggested distance for 8-9ft ceilings and at the same time often the limit where we can safely fish the wire through ceiling joists. 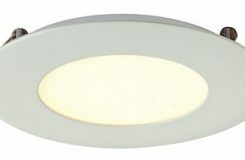 What is the difference between the New style flat LED and the old style Mr16 or Gimble LED potlights? 1) The Flat lights have a larger light area with even light than the MR16 light bulb. 2) The Flat lights are much brighter than the old style lights, use of dimmers is recommended. 3) The beam angle of the new style flat lights is about 110 to 120 degrees compared to the old style potlights that had 45 degree beam angle. What can I do if the Flat potlight burns out? 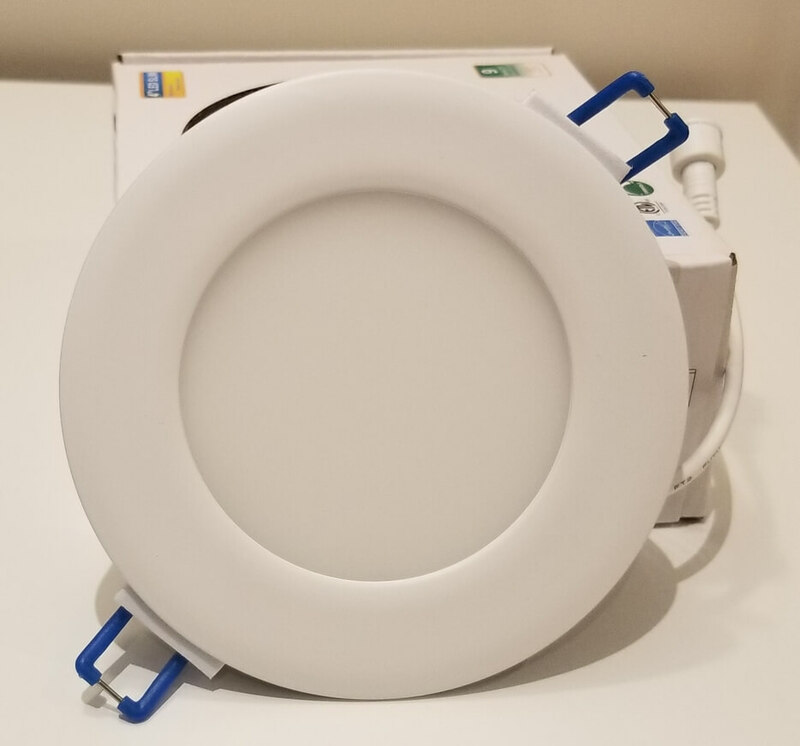 The flat LED potlights don’t have a light bulb, they consist of 2 parts, a LED driver which is part of a junction box and a light that is connected to it with a short wire and a small connector. The life of most of these lights is estimated to be around 25,000 to 40,000 hours, that is a very long time with regular daily usage . 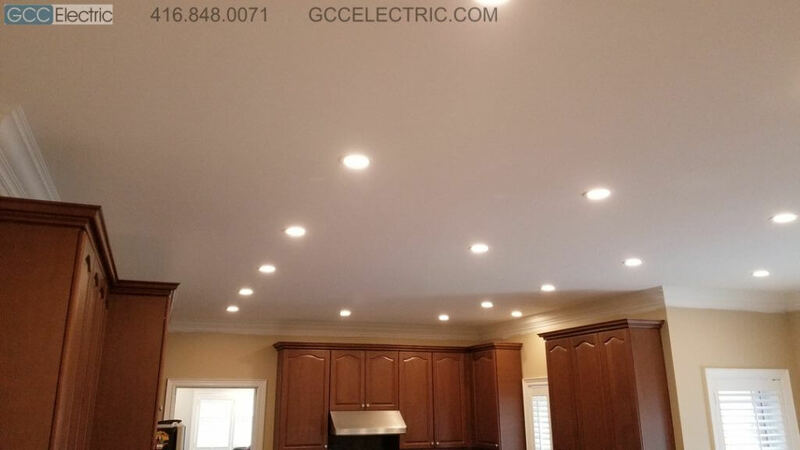 Obviously these lights haven’t been around long enough to test this estimate, but from experience of more than 3 years installing this type we know that if there is a defective light, it shows up at or shortly after installation. Most of these cases are solved by warranty replacement. There is an option to purchase a few of the lights from us during install to have them as backup. 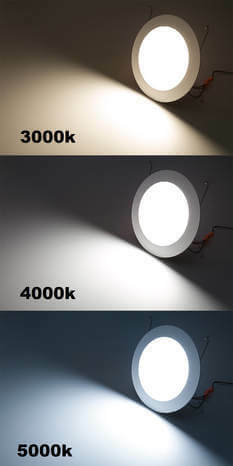 We have done many tests and long term trials and chosen a light supplier that has the best product and a stable design, so even if a light or driver burns out after years, there will be a good chance that we can replace it with the same design and look to match the rest of the lights in your house. 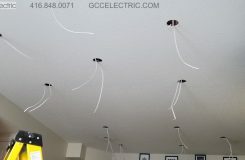 Why are the potlights installed on top floor or in insulated ceiling more expensive? The potlights installed on the top floor just under the roof cost a little more, because the process of installation is a bit more difficult. The insulation in the attic makes it more messy and we need to do more to cover up the floors and furniture. The wiring and cleanup in the ceiling with insulation can take longer. Should I get dimmers installed and what kind? 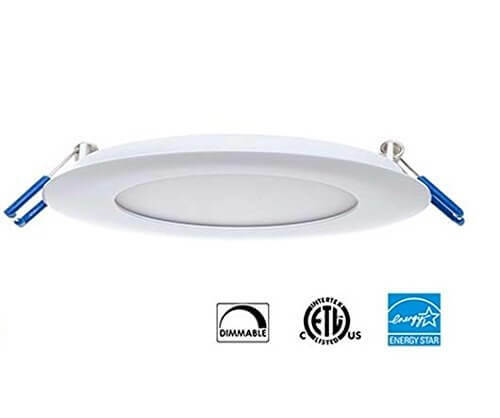 The Flat LED pot lights are quite bright, the use of dimmers is recommended in most living areas or bedrooms. 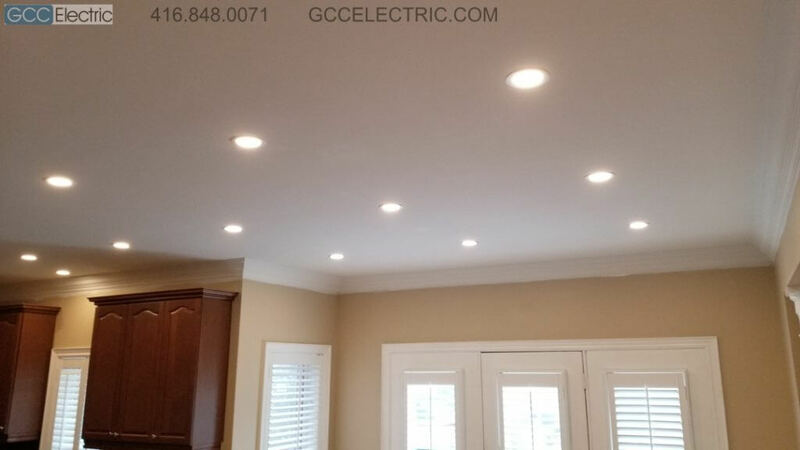 From our experience the LED lights are very sensitive to the type of dimmers used. To avoid buzzing or flickering we recommend higher quality LED dimmers. How do you make sure the lights are in perfect line? 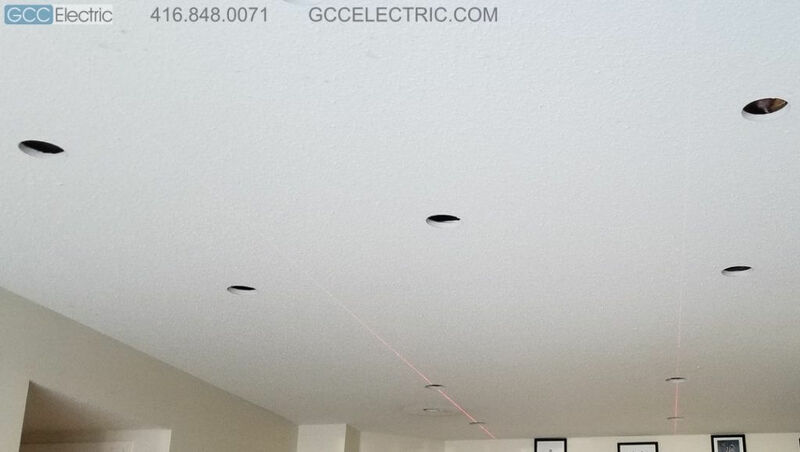 We use lasers to make sure the lights line up perfectly. What Crown moldings and Popcorn ceiling removal have to do with potlight installation? Not much, but it could be great timing to do it at the same time. 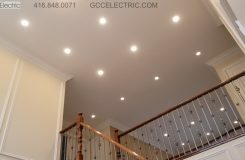 The final product can increases the value of your house a lot more than the potlights alone. It can give us great flexibility with lighting layouts, adding new switch-lines, pendant lights etc. 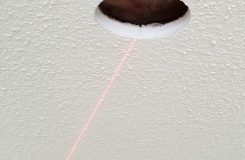 We can use the space under the crown molding to safely run wires, or make some extra holes to run wires to places we wouldn’t be able to without repairing the holes, the same time the holes left after the old lights could get repaired as well instead of covering them with white designer covers. Ask for a combo quote! 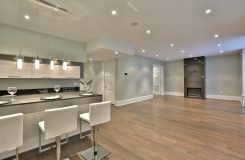 We work with the best Crown molding installers and Popcorn ceiling removal contractors in the GTA. We coordinate and schedule the projects as one job to be done at the same time. 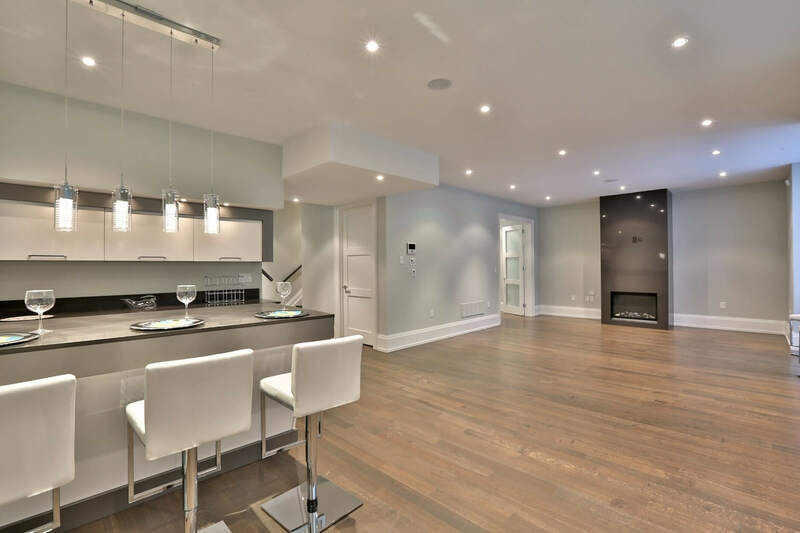 Call 416.848.0071 or click here to get in touch, schedule a free estimate visit or get a quick quote. 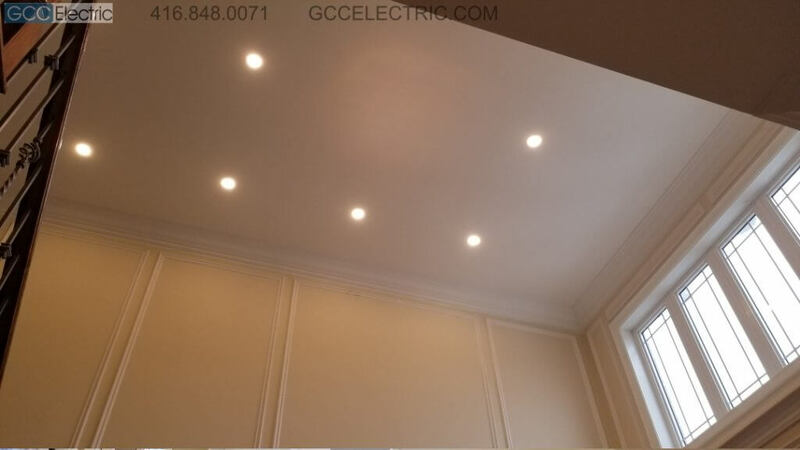 Slim LED potlights installed in North York Throughout main floor and 2nd floor, including 20 feet ceilings. Crown moldings and Popcorn ceiling removal. 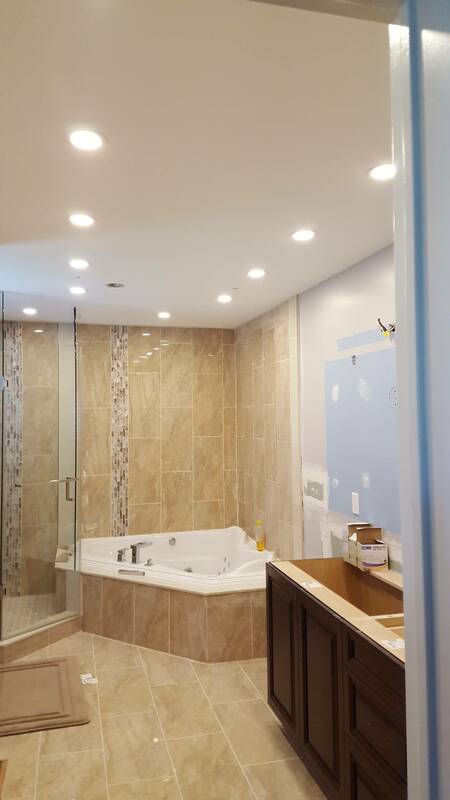 These Potlights were installed in North York, about 70 x LED 4″ Slim Potlights, 9W, 3000k – warm white light color, rated for direct contact with insulation and Airtight. We installed Lutron Skylark dimmers. All the floors and furniture were covered up for clean installation. 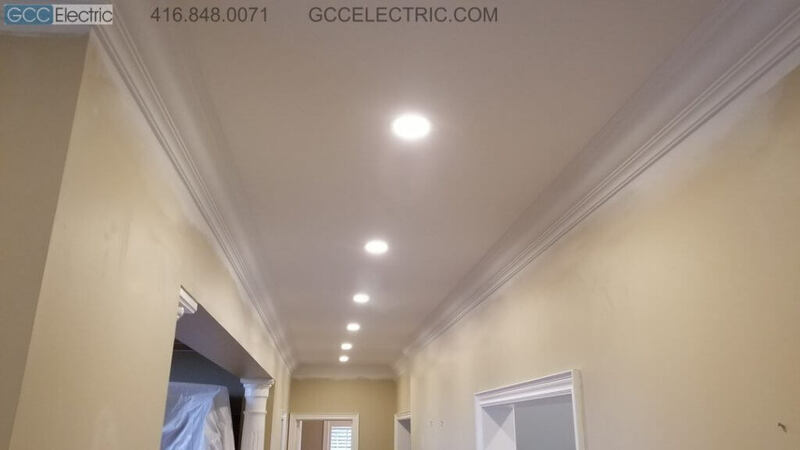 The Popcorn ceiling removal and Crown molding were done by our long time partner contractors we built great relationships with and through years proven highest quality of work and customer care. The photos were taken before painting the walls. 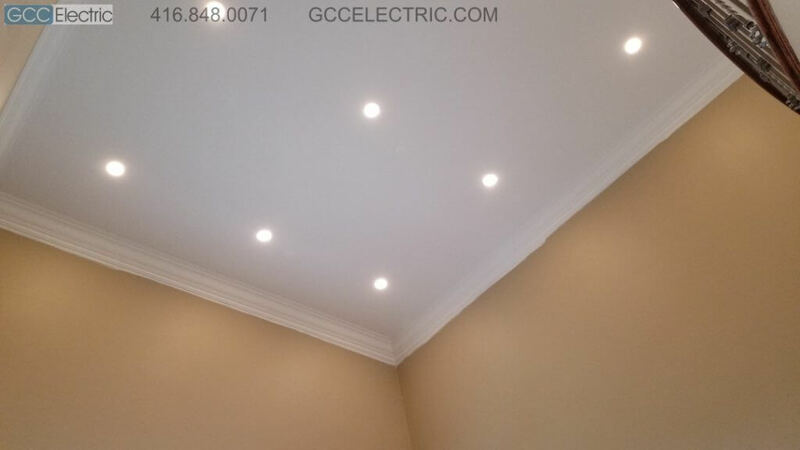 Call GCCElectric at416.848.0071 or click here to get in touch or get a quick quote. 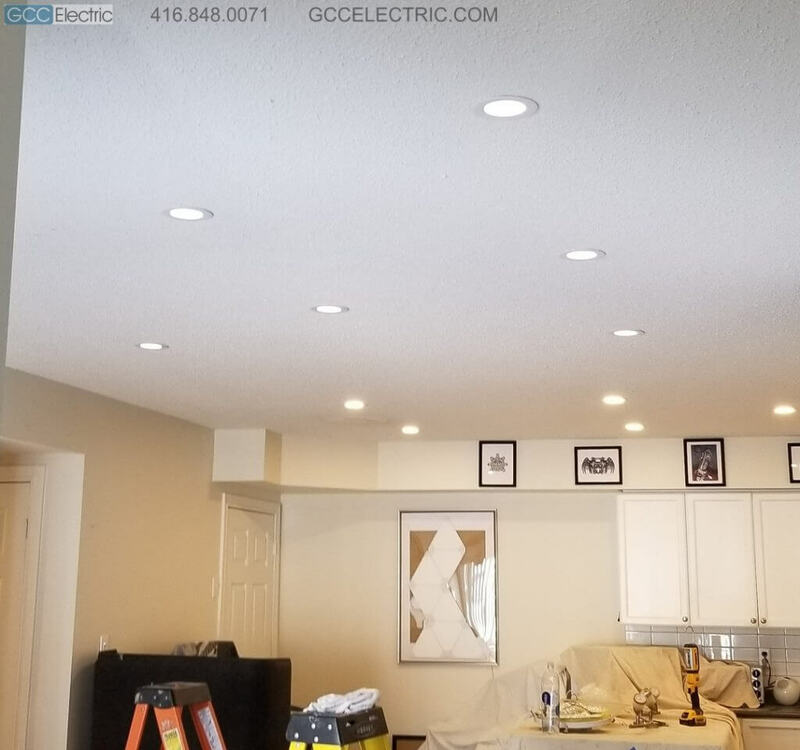 These Potlights were installed in Burlington, about 21 x LED 4″ Slim Potlights, 9W, 3000k – warm white light color, rated for direct contact with insulation and Airtight. We installed Lutron Skylark dimmers. All the floors and furniture were covered up for clean installation. 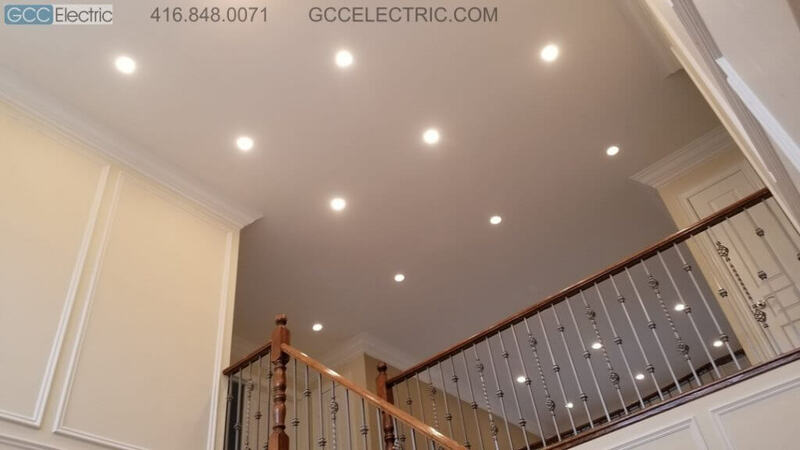 Another Potlight Job We did in Oakville, All the lights were installed on the 2nd floor, LED 4″ Ultra Thin Potlights, 9W, 3000k – warm white light color, ated for direct contact with insulation and Airtight. 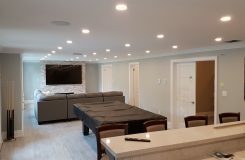 We installed Lutron Diva dimmers in all bedrooms. All the floors and furniture were covered up for clean installation. Smaller job in Missisauga in a few rooms and a hallway before painting the walls. Introducing the Newest in LED Recessed lighting. Simply click the link, fill out a secure form and get approved instantly.